CEH certification course was developed with an intention to attest the capability of network security or computer professionals. Once the student sufficient knowledge and exposure in troubleshooting techniques and adequate knowledge in terms of network security and computer field, they are awarded with CEH certification. The certified ethical hacker is a hacker certified in the field of ethical or positive hacking. Hacking is a term normally taken to be of negative nature but ethical hacking on the other hand is one such method which involves hacking to counter hackers. How to perform it without any data theft and data loss? From scanning networks to penetration testing, each and every minor topic is taught. Professionally breaking into network systems of company, owners. Evaluation of the loopholes seen in the simulated tests. Course gives you exposure in professional and legal aspects of Ethical hacking. Security officers and security professionals. Site administrators and anyone who is concerned about the integrity of the network infrastructure. People who have knowledge of C & Database. Banking sector officials and data administrators. Students and parents who are from non-technical background. IT and network related company know the importance of CEH because of his skills and knowledge in the field. The certification is accepted globally. 87 countries so far have acknowledged the EC-Council certification. There is a professional touch to the job. 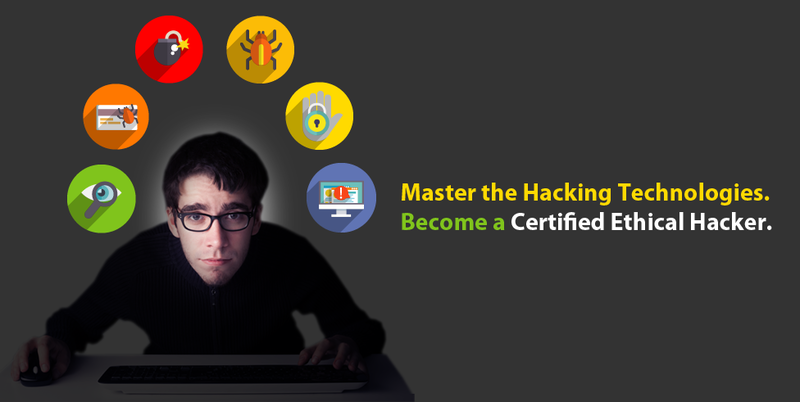 Certification provides a CEH to use the best of his hacking abilities in order to safeguard the interests of the company which a normal hacker cannot be trusted with. Availability is another benefit of certification.